If wishing a Facebook friend on his birthday isn't enough, users can now attach real gifts to their greeting with an expanded gift service that the social networking Web site announced on Thursday. Facebook has now opened up its Gift service to millions of users in the U.S., and also has added more gift options by partnering with more retailers, the company said at an informal event hosted at the famed FAO Schwarz store in New York City. 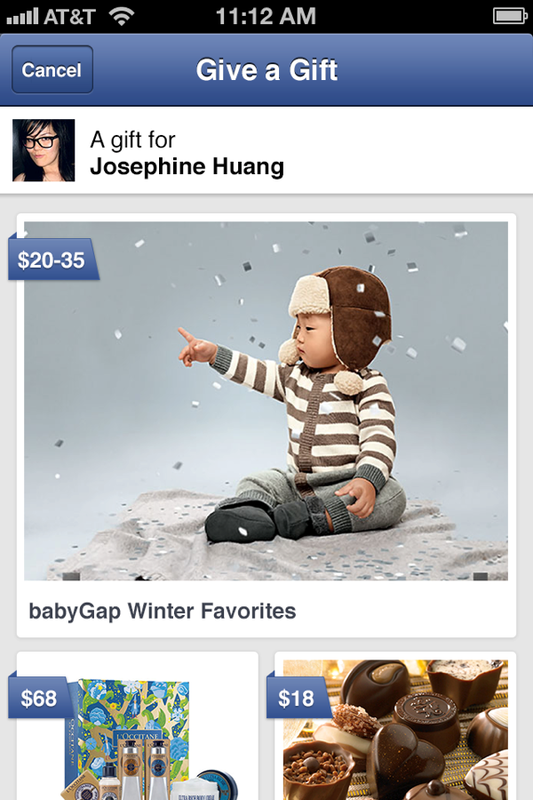 Users can attach real gifts to a greeting on Facebook, which is ultimately delivered to the recipient. Facebook is now offering hundreds of products from hundreds of partners. The new partners announced on Thursday include Brookstone, Dean and Deluca, L'Occitane, Baby Gap and Lindt. The gift options also include subscriptions to sites like Hulu Plus or Pandora. Attaching gifts is as easy as attaching a photo, said Lee Linden, who runs the Gifts service for Facebook, at the event. Once a gift is attached, the recipient will be notified by email and on mobile devices that a gift has been received. The recipient can preview the gift, and make changes, and add their shipping address to where the product can be delivered. Facebook handles the payment processing and shipping. The sender can pay for the gift immediately or at a later time. The gift can be private or publicly noted on a Facebook account, Linden said. For L'Occitane, the Facebook gift service offers a way to sell more products, said Jeff Petrosillo, a senior e-commerce manager at the vendor of skincare and bodycare products. The L'Occitane gifts offered via Facebook start at US$19 and are available only in the U.S. The company is keeping its offerings simple as these are only the initial days of the gift service via Facebook. Future additions could include swapping products for an in-store voucher, Petrosillo said. Facebook initially announced the gift service on Sept. 27, and the initial inventory of gifts and partners was limited. The service is currently available only in the U.S., and is an important initiative for Facebook. Company officials at the event said the gift-service is an untapped opportunity with a potential to grow in scope. It could ultimately act as a revenue generator, and help Facebook increase revenue from mobile, which has so far been seen as a struggle for the company. Facebook went public in May with an initial stock price of US$38. The company's stock was trading at $22.17 on Thursday at close of market.